She was part Édith Piaf, part Juliette Gréco, part disco diva, and part black widow. Under her stage name, the French-naturalized Egyptian-Italian Iolanda Cristina Gigliotti, a.k.a. Dalida, became one of the top-selling recording artists in European history, but her personal life was relentlessly tragic. 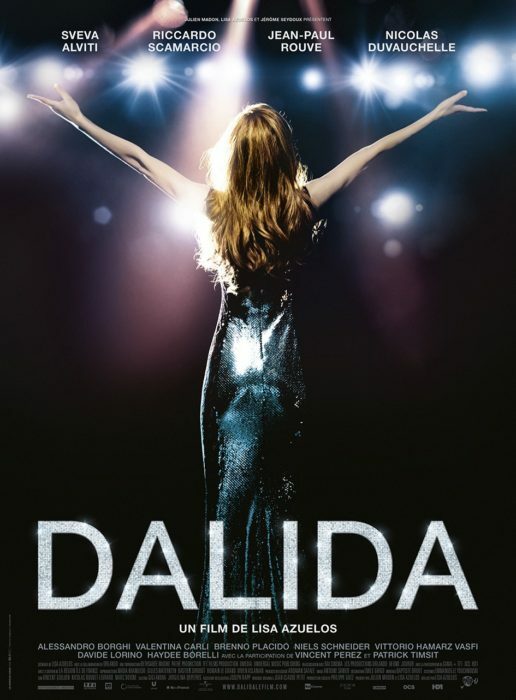 Lisa Azuelos, the daughter her Gigliotti’s contemporary, Marie Laforêt, gives her subject the glossy and gossipy big-screen bio-treatment in Dalida (trailer here), which screens as part of Laemmle’s Culture Vulture series this Monday and Tuesday. For the Gigliottis, music was the family business. Her beloved father was first violinist at the Cairo Opera, until he was warped and broken by his time in an Allied internment camp. Immigrating to France to pursue some kind of show business career, Dalida won a fateful radio talent contest in front of the network director, Lucien Morisse, and legendary record executive Eddie Barclay. Both men would play instrumental roles guiding her early career. Morisse also married her, but it would be a short-lived union. Dalida the film opens in media res, following her first, unsuccessful attempt to take her own life, following the suicide of her younger Italian lover. He will not be the last man in her life to opt for his final out-chorus. In fact, the darkly poetic notion that Dalida and death were constant companions is a recurring motif throughout the film. You might think she had met her match when she started a romance with Richard Chanfray, a magician and TV personality, who claimed to be the 700-year-old Count de Saint-Germain, but don’t count on it. Sveva Alviti is a strong likeness of Dalida and she manages to project class and dignity amid all the lurid melodrama. It is actually a very physical performance, with her looking frightfully skinny during the singer’s regular bouts of anorexia. Many of the music tracks actually feature the subject herself, but Alviti still has considerable stage presence and dance moves. Reportedly, Morisse’s daughter has taken issue with the way Azuelos and her co-screenwriter Orlando (Dalida’s brother) depicted her father, but Jean-Paul Rouve’s performance is rather complex and forgivingly human. For what it’s worth, as Barclay, Vincent Perez hardly looks like himself, but it is definitely a larkier role to play. If you dig French pop, then Azuelos’s film will be a great deal of guilty, dishy fun. Even if you don’t, it will lead to a considerable appreciation for Dalida’s talents. Not many stars can truthfully claim they worked with Egyptian auteur Youssef Chahine and Saturday Night Fever choreographer Lester Wilson, aside from her. Recommended as a whirlwind musical tour of mid-Twentieth Century France rather than high art, Dalida screens this coming Monday night (10/23) and Tuesday afternoon (10/24), as part of Laemmle’s Culture Vulture film series--with a VOD release due on 12/5.